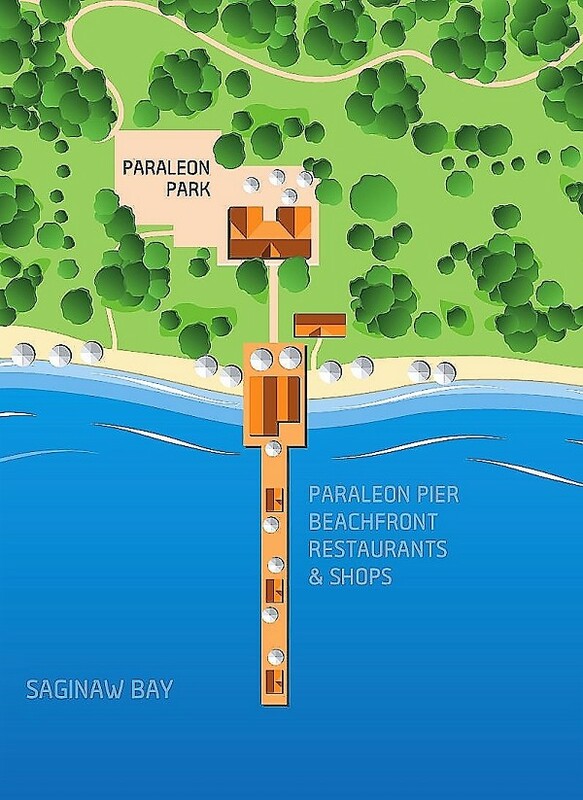 Conceptual drawing shows Chamber's hopeful Paraleon Pier development at State Park. Former Bay City Water Plant at foot of State Park Drive eyed by Chamber for development. In 1933, at the height of the Great Depression, an estimated one million visitors came to Bay City State Park, former park manager Bill Richter told MyBayCity.com in an interview many years ago. The pristine beach, cool green Saginaw Bay water and towering shade trees were the main attractions for heat harried big city folks from Detroit, Cleveland, Chicago and elsewhere in the Midwest. They came by train and auto, hauling their camping equipment and scores of kids eager for a woodsy experience up in Michigan. The theme of the Bay Area Chamber of Commerce annual meeting, "What Are You Wading For?" was not only a play on words but a call to action; let's get together and get greater access to the state park beach. Building on a campaign begun a few years ago by retired Chamber President Mike Seward, current prexy Ryan Carley gave an impassioned soliloquy to close out the night for 400 cheering attendees at the DoubleTree Hotel-Bay City Riverfront on Wednesday night. Independent Bank's Mike Stodolak, Chamber chairman, enthusing "how cool a theme is that" gave the opening plea to "build on what others have done," commenting: "We have waited too long for our beach -- to get it back." "Thousands of people are wading into our community, wading in with downtown living, wading in with capital and other keys to redevelopment of our community," he exclaimed, noting the $50 million Uptown complex, increasing uptown and downtown living, a forthcoming downtown marketplace and the sensational public draw of the Tall Ships Festival as examples. "If we all work for the common good this will be a better place to live, play and be," Stodolak summarized. He gave farewell commendations to retiring Chamber directors Al Blinke, Guy C. Moulthrop, Keith Birchler, Mike Thelen, and former chair Mike Hanisko. Downtown Development Authority Chairman Dave Green gave the 2016 Ambassador of the Year Award to Kendra Christensen of Copoco Community Credit Union, who also was the winner in 2015. Ed Keating announced the Business Hall of Fame winner Paul Begick, of Begick's Nursery, noting that Mr. Begick was a 1960 Horticulture graduate of Michigan State University, retired as a colonel in the U.S. Army Reserve, served in 1974 as president of the Michigan Nursery and Landscape Association, served from 1973 to 1990 as West Point liaison in the area. Chamber spokesman Eric Jylha noted that the Begick Nursery started the same year as WNEM-TV 5, 1950, and was the first advertiser on the channel. Mr. Carley paid tribute to City Manager Rick Finn, who is leaving the city in June, for helping create change in the community. He presented Mr. Finn with a plaque from the Chamber. Laura Ogar, Bay County Environmental Affairs and Community Development director, was credited with her work with the Michigan Department of Natural Resources, Department of Environmental Quality and U.S. Army Corps of Engineers on making improvements to the State Park and beach. Carley showed drone footage of the park on the jumbotron and pictures of the beach and proposed Paraleon Pier development. The audience responded enthusiastically to the question: "Is the park better today than it was three years ago." Now that we have 4,100 yards of clean groomed beach, the Chamber goal is for parking and restrooms that will improve public access to the beach, as well as a fishing pier and pavilion reaching out into 10 feet of water in the bay, said Mr. Carley, stating: "We want to advance the ball on those goals over the next 18 months. On the future wish list are retail shops on the pier, development of the now abandoned city waterworks -- perhaps into a resort complex. "Don't stop talking about improvements to the state park; we are better than that and I ask you to join me-- we have more work to do." The meeting was videotaped by Bay County TV and will be available next week on YouTube www.youtube.com/baycountymi and Charter Channel 190, according to Nick Paige, county TV technician.